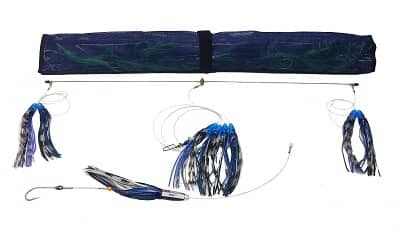 A set of four of our most popular spreader bars, in four of the most productive colors - each 36in medium flex titanium bar is rigged with 8 small tuna bits as teasers. A 250lb Ball Bearing snap swivel inside the last tuna bit on the center line allows for easy changing of the stinger. The center line is 250lb test Momoi, and the teasers lines are 150lb test Momoi. Each Stinger is a matching Tuna Snack Jr. rigged with a Mustad 7691 8/0 and 250lb Momoi. And every set comes in a custom 40in roll-up spreader bag for easy storage. A perfect set of bars for all species especially Tuna. Individual price per Spreader Bar is $129.95.